It was the fourth strongest in terms of wind speeds. The first claim is plainly meaningless, given that the Panhandle is only a tiny part of the whole US coastline. But what about wind speeds? The claim is that Michael had 1-minute sustained wind speeds of 155 mph at landfall. Yet the max wind gusts noted by the National Hurricane Centre (NHC) at landfall were 130 mph (although the instrument then failed). At nearby Panama City Airport, 129 mph was recorded. Hurricane experts reckon that gust speeds are typically 30% higher than sustained speeds, so a gust of 130 mph would indicate a sustained wind speed of about 100 mph, making Michael a Category 2 hurricane. Given some of the damage caused, this may be an underestimate though. But where did the 155 mph figure come from? The claim of 155 mph was based solely on SFMR measurements, which the NHC already admit are questionable. Prior to the SFMR measurements, NHC was saying wind speeds at landfall were 150 mph, based on Hurricane Hunter aircraft data. The difference between 150 and 155 mph may sound academic, but it makes a whale of a difference to the claims of 4th strongest. At 150 mph , or 130 Kts, Michael would be only one of nine hurricanes on record as strong or stronger. During the 19thC, there may have been similarly strong storms, which went largely unobserved. 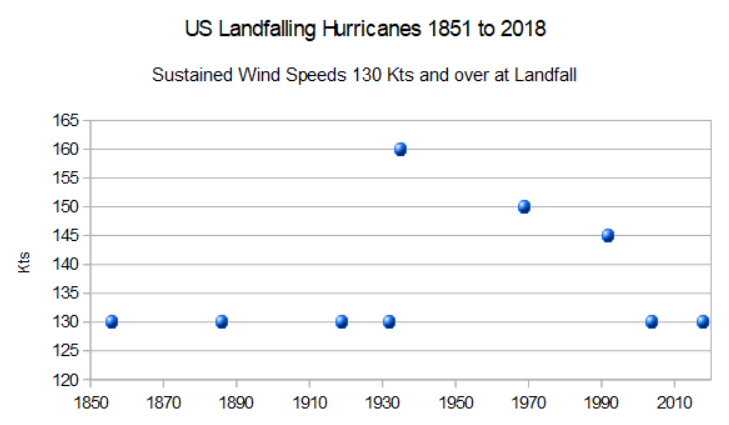 [Note – wind speeds are based on re-analysis work by NOAA’s Hurricane Research Division]. And, of course, it fortunately got nowhere near the Labour Day hurricane of 1935, Camille in 1969 or Andrew in 1992. There is also another clue to the real strength of Michael, the storm surge. Maximum surge seems to have been around 7 feet. 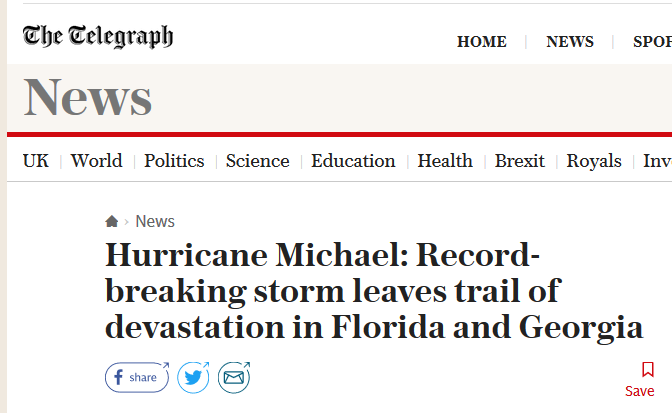 I have heard this described on a news bulletin as “epic”, which is utter nonsense – this is not unusual for any hurricane. 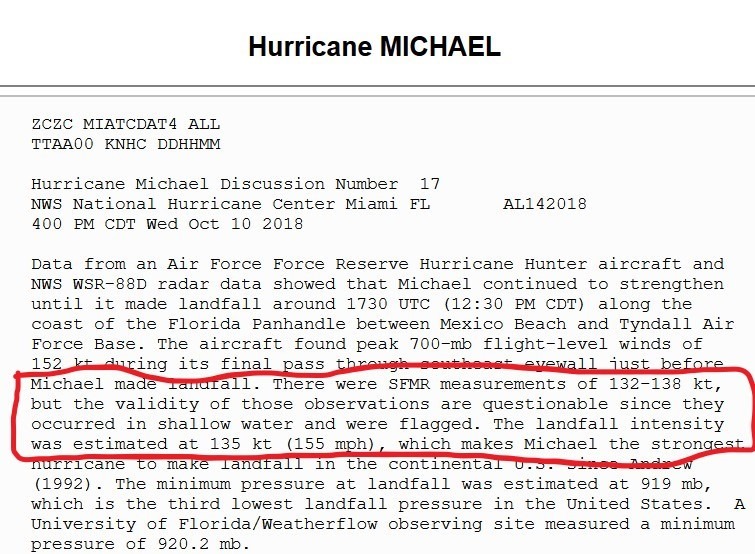 A surge of just 7 feet would suggest that Michael’s wind speeds were much less than claimed. There is one more clue. NOAA use a variety of methods to estimate surface wind speeds. One uses data from a number of satellites. Apart from one outlier, all of the satellite data points to wind speeds of well below 120 Kts, well below NOAA’s official intensity estimate of 135 Kts. 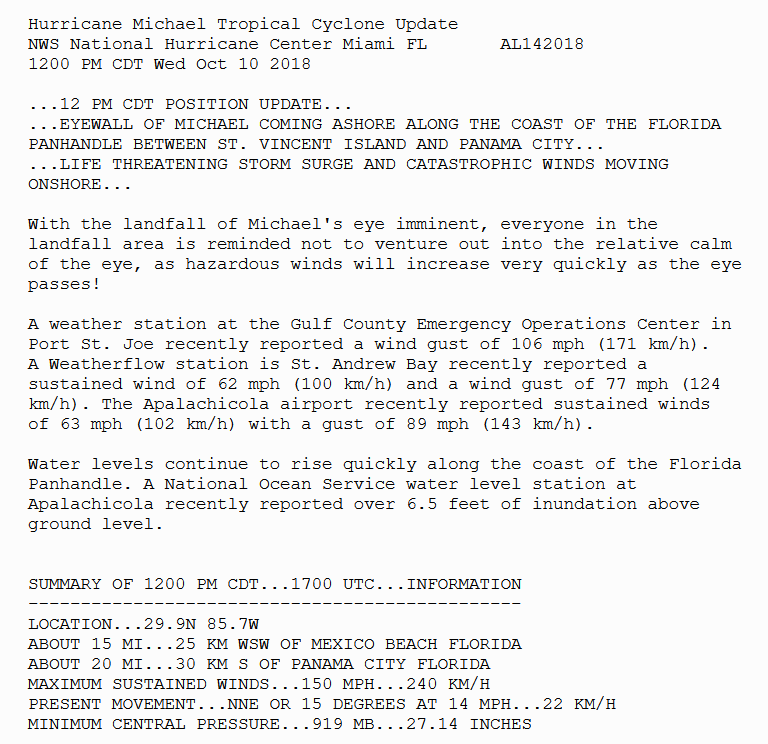 From all of the information available, it is most likely that Michael was no more than strong Cat 3/ weak Cat 4 hurricane, with winds of around 110 to 115 Kts, or about 130 mph. We still have the claim that Michael had the third lowest barometric pressure at landfall, only beaten by the Labor Day hurricane and Camille. Although the readings are no doubt correct, we know that Hurricane Hunter aircraft kept well away from the centre of the strongest storms in the early days, so we have no way of knowing whether other storms prior to Camille were as intense, unless surface observations were available. The measurement neat Tyndall is from a Florida University WeatherFlow site. WeatherFlow Inc. is a leader in the private sector weather industry, with over two decades of experience in applying the latest in observational, modeling, and forecasting technology to its clients’ most challenging problems..
With official weather observing networks historically focused on aviation, recent years have seen a dramatic increase in the number of public and private mesoscale observing networks (mesonets) installed to fill in the data gaps between official observing stations. State-sponsored networks like the Oklahoma Mesonet have contributed to significant advances in real time warning and detection of severe weather, while the proliferation of affordable home weather stations and the ability to post that data online have resulted in an explosion of ad hoc observational data available via the Internet. Recognizing that specific applications and specific users have a need for high quality, high density, and consistent observational data, WeatherFlow operates the largest professional observing network in the United States, including the only large scale mesonets dedicated specifically to coastal zone and hurricane monitoring. Although often installed to meet one specific need, each station and mesonet is designed and operated to support multiple user communities and functions, providing a superior value by allowing the costs of installing and operating the networks to be spread across many customers – yielding better service for a fraction of the cost of a single-user system. They set up networks of weather observation sites, in conjunction with a whole host of clients and partners, of whom Florida University is one. In short, there are now many more weather observing sites than there used to be in the past. The minimum pressure of a hurricane is confined to just a tiny part of it, at the centre. The odds of having equipment capable of measuring it at just the right place are much higher when you have thousands of sites. (Not to mention having equipment that is actually capable of operating during bad weather!). How many hurricanes in the past have had much lower pressure than officially recorded? For instance, the deadly Indianola hurricane of 1886, which is estimated to have been 925 mb, or the Great Miami hurricane of 1926 at 930 mb. We will never know. But what we do know is that by using modern networks with tens of thousands of weather sites, we are not comparing like with like. Michael may have had the lowest pressure of any storm since Camille, but such claims cannot be made for earlier periods. Well done Paul for this very detailed and thorough assessment. But the propaganda has been widely spread before you have brought the truth out. I second Phillip’s sentiments Paul. Next stop, an assessment of the BBC’s hysterical reporting of the “devastating”, “unprecedented” floods in Wales. After all, it is mid-autumn and west Wales we are taking about, why on earth would we expect any downpours? Once again the lies are round the world before truth has its boots on. Another nail in the wall of the BBC Moral Maze. The key to the pressure record is the word “Estimated”, ie not measured as they used to be. All of the Aircraft and Satellite data is used with algorithms to estimate what the Ground conditions are and they are always over hyped. The fact that a modern anemometer broke with a gust wind speed of 129mph is a disgrace, older equipment has been known to survive at 150mph+. ps Paul it appears that most of the really bad damage was caused by that small flood surge of 8 or 9 feet. See the many comparisons by Tony Heller. One other thing: these statements are honest enough to give us estimated values, but they’re never, seemingly, honest enough to give us a proper uncertainty range nor point us to the verification/validation work that would help us figure out that uncertainty range. 130 kt +/- 20, say, would tell us a lot more; which when crosschecked against damage done, then help us find systematic upward biases. Nice work Paul and I agree with most of it. The main exception is the highest storm surge, which probably occurred in the Mexico Beach area where the most probable highest 10-meter above ground level winds hit blowing directly onshore. I have not seen any estimates of storm surge at that location yet, but guesstimating from aerial imagery, it might have been 10-15 feet or possibly a little more. The Apalachicola tide measurement site was well removed from the highest onshore wind zone and thus not representative. Also, there were no wind measurements at Mexico Beach as far as I know, so the peak onshore winds at the coast were probably not measured. Sustained winds speeds drop off very quickly as the wind moves inland because of greater surface friction over the land than over the ocean and the result is much higher ratios of wind gust to average wind speed and even a reduction of the peak wind gusts as measured at 10-meters AGL. The wind measurements were at locations where the wind would have traveled many miles over land before reaching the site. Trying to estimate winds from damage is crude at best, but that is what was done to raise Hurricane Andrew from an estimated Category 4 at the time it made landfall to an estimated Category 5 from post analysis of damage. I have not seen any engineering estimates of wind at Mexico Beach based on damage. There were quite a few buildings that looked intact in the imagery and were presumably better built to withstand high tides and high winds. The whole business of trying to estimate the wind and storm surge intensity of hurricanes is fraught with uncertainty even today, with greatly increasing uncertainty farther back in time for historical storms. Most attempts to rank storms do not take this uncertainty into account. It is one thing to overestimating the Saffir-Simpson category during a storm based on the best data available. It is quite another to record that overestimation as the official historic record once the land station and buoy data has been observed which shows a different result and that is exactly what NOAA is doing. RAH, take a look at this video of the storm hitting Mexico Beach. According to Dr Roy Spencer the ground elevation at the pole where the video camera was mounted is about 19 feet above mean sea level. The storm surge appears to reach several feet at that location with extremely high winds at the peak of the storm, indicating a storm surge over 20 feet there. Too bad there was not a wind instrument there, although unless very well sited and secured it probably would not have survived without damage. It’s amazing that the video camera survived, apparently mounted on a power line pole. Other power line poles in the camera view disappeared after the high winds. The peak onshore winds in this hurricane impacted a relatively small area right at the coast in Mexico Beach. This situation is not uncommon with intense hurricanes and also means the strength of many older historical hurricanes may have been easily underestimated because there were no measurements at that peak onshore wind location or damage was minimal because that location was in an unpopulated area. Much more of the coastline is heavily populated compared to even 50 years ago and way more than 100 years ago. On the road and unable to respond in the detail I’d like. Thanks for the video. Pretty interesting. Nine feet was Max surge that I read. But in my book comparing this storm to Andrew that struck Homestead is pure BS. Thanks Paul – – and the comments. They are comparing it to Andrew which was a tight little CAT V that his southern Florida in 1992. There is no comparison. Andrew was a buzz saw almost like a giant EF-4 tornado in it’s effect. No home of standard construction is going to stand up to 165 mph winds. And based upon what I’m seeing from Michael, it was a bad storm but no where close to Andrew in wind speeds. FACT: The standards for the Saffir-Simpson scale are based on direct readings from ground stations or buoys taken 10 meters above the surface and the standard for classification is the maximum wind speed sustained for 1 minute.. FACT: Every other method relies on data that does not meet that standard and are estimations. No dropsonde from a hurricane hunter aircraft can take the required measurement Saffir-Simpson classification. From what I have seen the actual windspeeds as taken as per NOAA’s standards for Saffir-Simpson grading indicate the estimates provided by the other systems of remote sensing are too high by 1 or even 2 grades. If someone wishes to argue with that claim I would ask they produce the record for the highest 1 minute sustained windspeeds taken as per NOAA specifications for Florence or Michael this year or for that matter Irma from last year. No one has produced any so far that justifies the claimed Saffir-Simpson grading for any of those storms. RAH, you have got it in one, telling people that the Hurricane/Typhoon/Tornado is dangerous is one thing but then using that to compare to historical data to try and prove a point is fraud. Here is a bit of conspiracy theory in a poorly made video with a lot of data but it makes you wonder about the real wind speeds.